I am a great Art lover, but Impressionism is my favourite period in Art History. The Impressionists changed the way people thought about Art and made them look at it in a new way. The Impressionists were bold, brave and not afraid to take risks. They painted the world around them as they saw it. Their work was their interpretation of life. They didn’t feel obliged to paint religious scenes or historical events and this freed them from what was perceived as traditional Art at the time. They were among the first to paint ‘plein air’ – basically painting outdoors – due to the invention of the steam train and the ability to go further afield. Also at this time, oil paint became available in tubes, making them compact so easy to carry around. Degas did not like the term ‘Impressionist’, although he did exhibit with other Impressionist painters at their exhibitions. 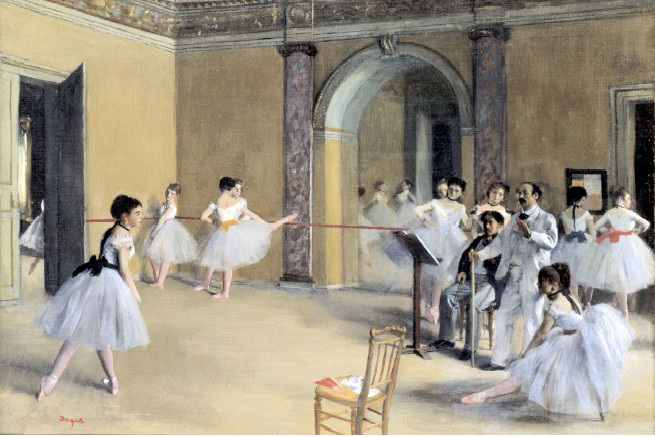 I have looked closely at Degas whilst researching my Major Project A and really love the work he did of dancers in different settings. I especially love the paintings of dancers whilst rehearsing. Today, Traditional Art can be seen many ways. You can go and visit it at an Art Gallery, look at it in a book, or – with the help of modern day technology – you can find just about any piece of art on the internet! The internet is a wonderful learning tool that can bring us face to face with things we would never get to see. Art Galleries and Museums all over the world are now understanding that modern day technology can work with Traditional Art, not against it. The National Gallery for example (http://www.nationalgallery.org.uk), enables the viewer to look at their collection online, without even leaving your sofa! Exhibitions are becoming more interactive and I think this helps to keep Art up to date and relevant. More importantly, it keeps the kids interested!